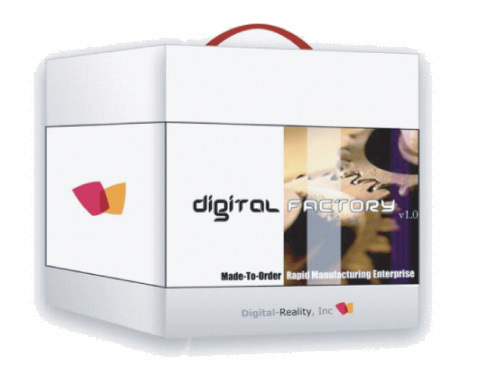 IN COMPLIANCE WITH STATUTE 35 USC § 287, YOU ARE NOTIFIED THAT DIGITAL FACTORY™ IS BOTH A PROPRIETARY BUSINESS MODEL AND MANUFACTURING PROCESS PROTECTED BY MULTIPLE US PATENTS AND PATENTS PENDING. The present invention relates to the design, sale and manufacture of made-to-order or mass-customized products. More specifically to a computer-based method and system for customer-driven design, sale and manufacturing of unique or custom-made product(s) exclusively through a highly efficient sales & manufacturing system which advantageously combines key elements of computer aided design methodologies, the internet and Additive Fabrication methodologies to personalize or customize said products on-demand. 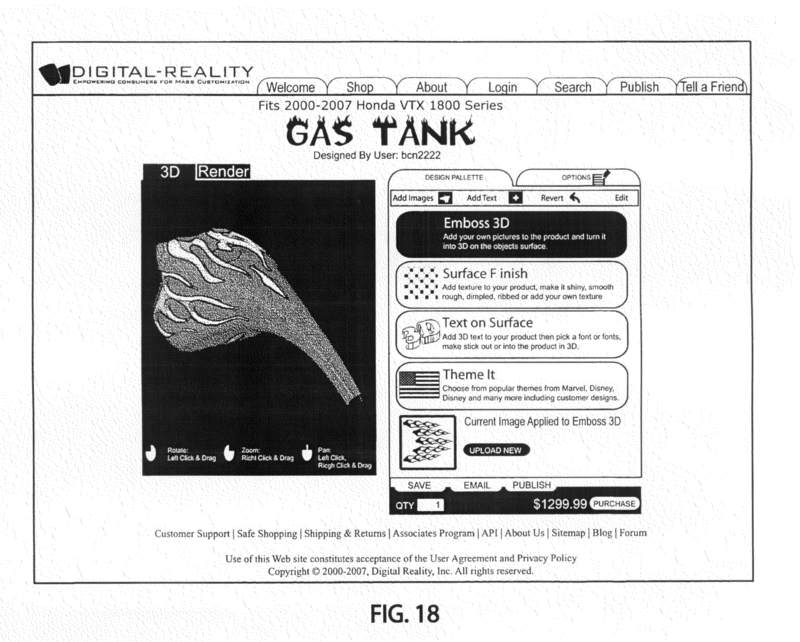 The product and invention was first demonstrated in May 2006 and remains published at http://digitalrealitycorp.com/demo3D/index.htm. The system is in-fact a "factory-in-a-box" solution envisioned as a platform to license to other businesses so that they may conduct Ecommerce in this new and innovative manner. This system was first demonstrated to the US Department of Defense in spring 2005 and to non-disclosed parties in 2004. Fig. 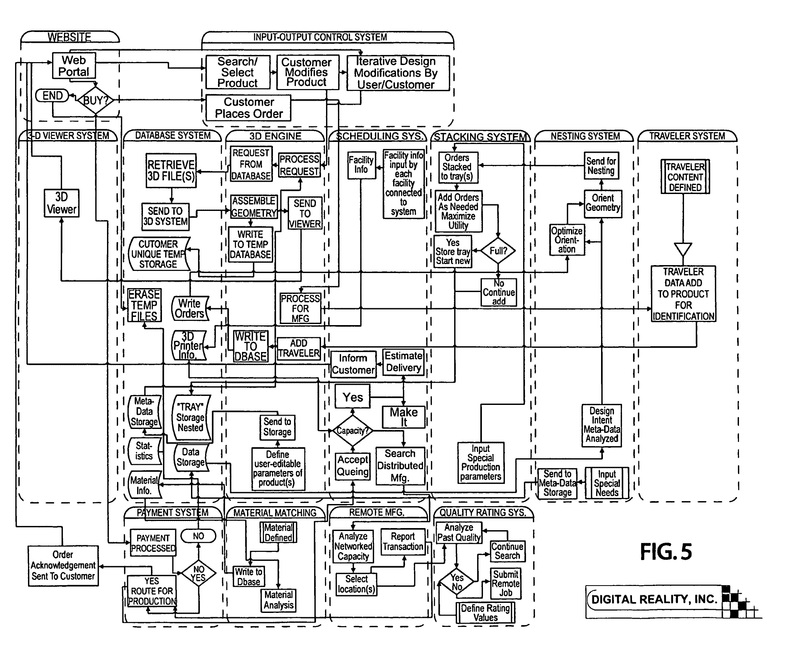 5 Depicts the Flowchart of the system carrying out the patented process for web-based mass customization in a browser. Note that each "discrete" module is clearly labeled including a Website, a Payment Gateway, An API or Suite of Controls to the core system and the core system comprising a 3D Kernel and a Database System, for storage and retrieval of the base 3D Models within the system. The customizations are done to the 3D Models using the Input output controls by anyone accessing the website and using the controls. The 3D Kernel or "Engine" is responsible for making the modifications to the 3D Model. The Scheduling and nesting system are highly integrated and mostly automated in the invention to streamline production. The Traveler system is a patent in and of itself and represents a method to automate part marking in such a system physically on each model to facilitate ease of finding each order even when they are similar. Fig. 6 Depicts the overall workflow of the system as envisioned and written in 2005. 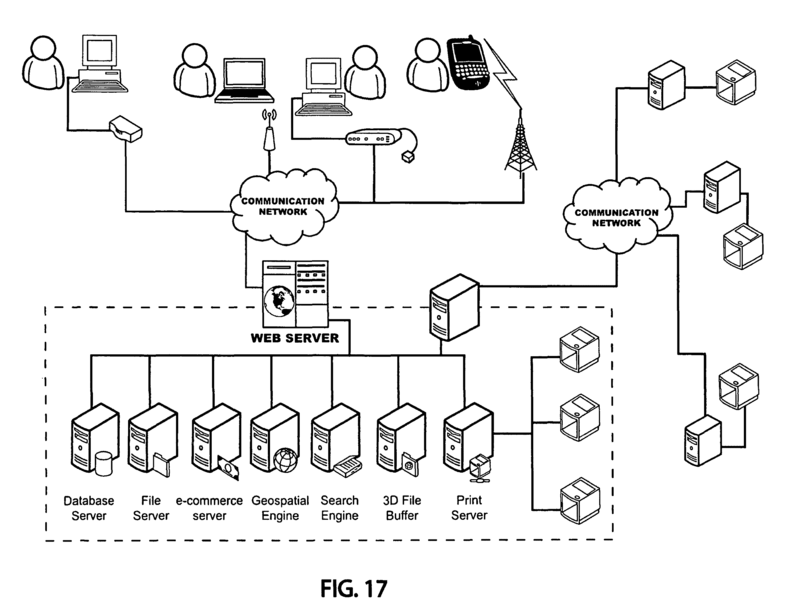 Note that the system shows a user accessing the system via a computer through a connection to a suite of computer servers that carry out the operations including data preparation for printing. Files are sent to a 3D Printing, produced, handled for packaging and shipped to the customer. Note: The image depicts specifically making custom Jewelry this way. Fig. 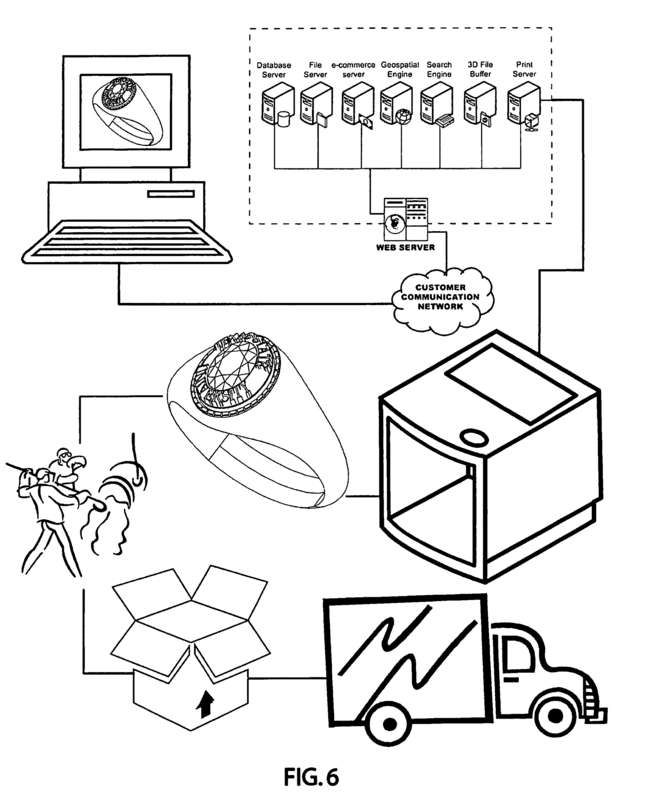 8 Depicts someone accessing the system from a computer and the results being sent to any one of an array of printers which represents any one of a number of different types of printers representative of the process as well as how to distribute manufacturing to many printers as described in the patent with regards to distributed manufacturing and production scheduling to "Load-Balance" the system. Figure 18. Depicts the www.digitalfactory3d.com domain with an example of a website portion of the invention providing the interactive design session in the browser for customization of a product. A number of example features are demonstrated. 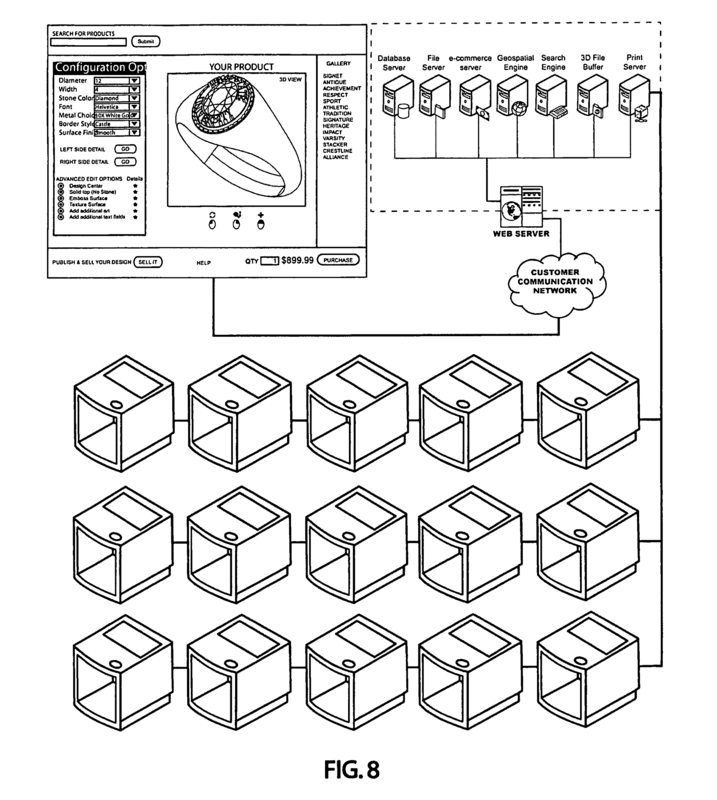 Note that this image also depicts that an API is available and that the system is displaying both a 3D Model/rendering of the product and a Photograph which are very different distinctions in the patent. Displaying a 3D Model/rendering is what facilitates seeing the actual changes to the 3D Model. Fig. 17 depicts Both Local and remote production systems and varying methods for accessing the system.